In what may be the most exhaustive look yet at bodybuilding’s long and winding history, Muscle, Smoke & Mirrors: Volume 1, weighs in at an encyclopedic 562 pages, each meticulously researched and engagingly written. 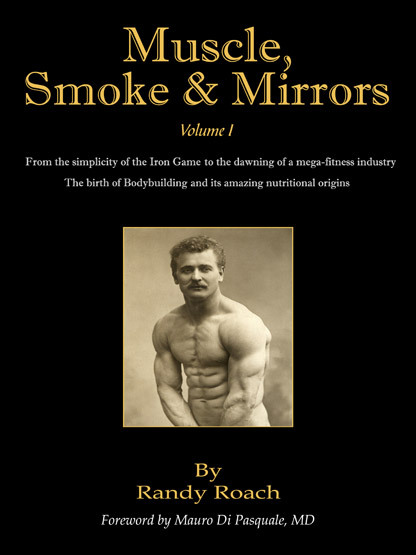 Author Randy Roach spent five years compiling and writing this, the first half of a 1,000 page, two volume set that covers bodybuilding from the days of Eugen Sandow to the dawn of the 1970’s. Volume II will pick up from there and carry through to today. All the major players in the sport’s history, from the Weider brothers to Bob Hoffman to Vince Gironda to Oscar Heidenstam, as well as athletes too numerous to mention, are given their due in a storyline that reads like a good historical novel. Some great vintage photos pepper the prose, and there are 17 pages of references in the back of the book.